The Dallas Mavericks' remarkable run of 50+ wins and playoff appearances for 12 consecutive seasons has ended. And it's not difficult to see where the decline began. As the Mavs tonight prepare to make a Lottery pick (13th) for the first time since 2000 when they fanned on Syracuse forward Etan Thomas, we're reminded of how general manager Donnie Nelson, owner Mark Cuban and the front office has continually failed to acquire draft-night talent to surround its all-time draft-night jewel, Dirk Nowitzki. While in this century the Mavs have launched air-ball acquisitions like Maurice Ager ('06), Nick Fazekas ('07), Roddy Beaubois ('09), Dominique Jones ('10), Rudy Fernandez ('11) and Jared Cunningham ('12), elite teams such as the San Antonio Spurs, for example, have used similarly low picks in the 20s+ to stockpile legit talent such as Manu Ginobli, Tony Parker, John Salmons, Luis Scola, Leandro Barbosa, Beno Udrih, Tiago Splitter, George Hill, Goran Dragic, Kawhi Leonard and Cory Joseph. Of course, in the Mavs we're talking about an organization that drafted Chris Anstey ('97), Randy White ('89), Bill Garnett ('82), Leon Smith ('99) and, in '96, Samaki Walker - four picks before a guy named Kobe Bryant. Sure, Tim Duncan is one of the NBA's Top 10 all-time best players, but the reason the Spurs have trumped the Mavs since '00 is directly attributed to draft doings. 1. Draft a "rotation" player that can help them win now. 2. Trade the pick to save about $1.6 million in salary-cap room that would help in a free-agency run at Dwight Howard. 3. Select a player in a "Euro Cap Stash", temporarily alleviating a salary hit while acquiring an asset for the future. In option No. 1 the Mavs would look to fill holes in their roster ... everywhere. They've had a stream of candidates working out at American Airlines Center this summer including Miami guard Shane Larkin, Michigan guard Tim Hardaway, Jr., Pitt center Steven Adams and Syracuse guard Michael Carter-Williams. In option No. 2, the Mavs would deal the pick, its financial baggage and possibly another asset - Shawn Marion has been mentioned - to create cap flexibility. In option No. 3, the Mavs would travel the boring, worn path overseas where it would draft a kid with more syllables in his name than skins on the wall. In case you haven't gotten your fill of former picks named Targuy Ngombo ('11), Renaldas Seibutis ('07) and Vassillis Spanoulis ('04), scribble down this year's foreign targets: Dennis Schroeder (German guard), Giannis Antetokounmpo (Greek forward) and Sergey Karasev (Russian guard). Though we'll never entirely lose the goosebumps from the magical '11 championship run, the reality is that the Mavs are now in the uncomfortable Purgatory between adding win-now talent for one final push with an aging Nowitzki and re-building a nucleus with young players that will peak down the road. All the sudden the Mavs haven't won a playoff game in two years and since the braintrust decided to let Tyson Chandler walk after '11 they are a mediocre 77-71. The quick-fix delusions of grandeur of luring Howard from the Lakers are tantalizing but, regardless, the for the Mavs to remain competitive with teams like the Spurs they must at least match them in the NBA Draft. I may be in the minority here, but I believe that if D12 signed here in DFW it would be a mistake. 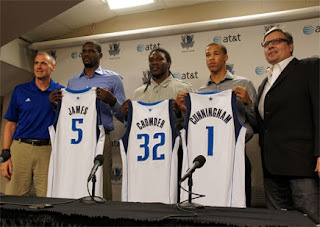 I would like to see Dallas counter everyone's efforts to form Big 3's by stacking a roster deep of solid players 1-12. I would love to see them pursue guys this off season like Andre Igudalua, Brandon Jennings, Jose Caldaron, Andrew Bynum. And then go after 2 more next year when Dirk takes his paycut. The one positive I have to say about this organization is that they have put themselves in the position to go buck wild the next 2 years in Free Agency whether it be by signing 1-2 max players or 4-5 solid 6-9 million dollar guys. Not everyone can have a big 3 and while all the other teams are fighting to get 1, Dallas can slide in a build a solid rotation that compete now and in the future. What would you like to see them do RW? I agree with you I do not think two 7 footers on the court who both require the ball to score is a good fit. Andre and Jennings are solid players but will require a near max deal and thus cap the future signings of this club. I do like the name of Bynum. He does not need to shoot 20 times. The question with him is will he be a head case. I have been reading all about the Mavs and Carter Williams....give me Larkin. I think if there is a star out there he will be the one. As a Spurs fan, I've never hoped or expected that they would be a big player in free agency. When they were(see Rasho Nesterovic & Richard Jefferson) the players never panned out. I fully expect when Duncan retires that they'll tear the team down and rebuild. Now that I've said that, why aren't the Mavericks doing the same thing for Dirk? He's a transcendent player with less than 5 years left. Yet they keep whiffing on draft picks and free agents. If they're worried about drafting a player because of a 1.5 mil salary hit and not getting Dwight Howard, they're thinking the wrong way. Draft the best player you can, if you get Dwight Howard, the money you pay in penalties will be recouped in ticket sales and jerseys and everything else. Hell raise your ticket prices, just don't screw the best player in franchise history over. If the Mavericks aren't all in, then they should let Dirk go and get as much as they can for him, and that value is decreasing steadily. RealDirty, there's a flaw in your logic that the Mavs could recoup their losses in jersey sales and raised ticket prices. Your assuming there are enough people here willing to buy those jerseys and pay those higher prices. Truth is, this is even less of a basketball town than a baseball town. Players from Chris Bosh to Vince Carter have spoken out about the lack of support this team gets. Even with all those playoff appearances, Cuban has lost more than 150 million dollars on the Mavs. The Lakers can get away with overpaying. The Mavs can't because nothing they can do will generate the revenue in a town that cares almost nothing about basketball. Here's hoping the tact will be add free agents (better ones) with only a couple good Dirk years left!